The Museum has a collection of megalithic wares from several sites near Hyderbad in Andhra, excavated in the 2nd and 3rd decades of this century by E.H. Hunt and belonging to what is termed the South Indian Iron Age or Megalithic Grave Complex. While iron age graves in Andhra and Tamilnadu characterised by the megalithic wares have been extensively investigated, they have been marked by an almost total absence of the terracottas depicting humans and animals which are such a common feature of the early historical period in India. This may be due, of course, to the fact that very few settlements, as opposed to graves, have belonged to complete animals, appear to be unique. The heads portrayed [EAX.235 and EAX.236] are of quite different animals. 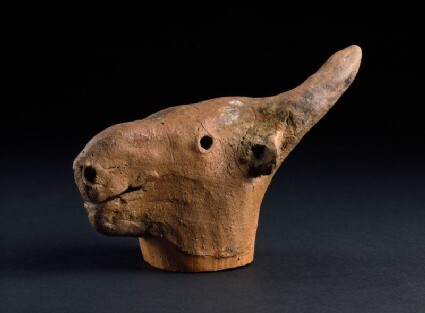 One would appear to be an antelope with its relatively pointed head and straight swept-back horns. The other has a highly distinctive appearance and since there appear to be no other examples in pre-historic or early Indian art, one must assume that the animal was known to the modeller. With its straight-sided jaw and raised nasal region, indicating what appears to be an abnormally large nasal cavity, there is a striking resemblance between the animal depicted and a saiga (Saiga tatarica) of S.E. Russia and parts if Central Asia.